It is most popular in Slovakia. 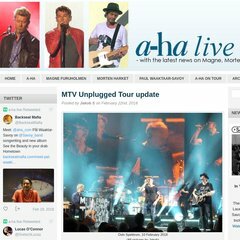 Topics: A-ha, Concerts, Magne Furuholmen, Morten Harket, Paul Waaktaar-savoy, and Itunes. The estimated 959 daily visitors, each view 1 page on average. remembertheeighties.co.. Remember The Eighties - The music of the 80s... up to date! The site is programmed for PHP/5.2.17. There are 2 Nameservers, ns58.1and1.com, and ns57.1and1.com. 1 1 Internet Inc. Pennsylvania is the location of the Apache server. A ping to the server is timed at 0.842 ms.